Lothian and Borders GeoConservation is the biggest and most active geoconservation group in Scotland, and covers Edinburgh, West Lothian, East Lothian, Midlothian and Scottish Borders local authority areas. The LBGC Committee meets twice a year, and includes representatives from these 5 local authorities. The Committee works with the local authorities to identify Local Geodiversity Sites and promote them. 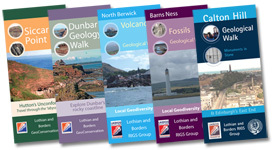 The LBGC Volunteer Group prepares leaflets and other publications about local geodiversity, organises events and take part in local activities. We welcome anyone interested in any aspect of local geology and conservation. The group has evening meetings every month in winter, and gets involved in occasional work parties and promotional events. At our informal evening meetings we discuss ongoing projects, and everyone is welcome. Come along and find out more! For further information, or to be added to the Lothian and Borders GeoConservation Group email list and kept up-to-date with our activities, please contact the LBGC Secretary – see the Society Contacts page for details. about Local Geodiversity Sites and other areas of interest.